Hi! I'm Rachel and as the title says, I am so excited! 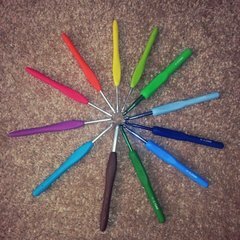 I'm so glad that I found this forum and I am so excited about meeting new people that crochet. Crochetville seems like a great place to be and I can't wait to get starting exploring all the threads. I think I'm going to get started right...about...now! Hi from Indiana, and welcome to Crochetville! The people here are so great and helpful. You'll love it here. thanks MarciMarie for the warm welcome! Rachel from Minnesota Glad you found us here. Glad to meet you Rachel! I checked out your blog spot and love the format and layout. Very nice and I look forward to more projects from you. Hi Rachel, glad to have you aboard! :welcome A Big Hello & Welcome from CT !!! You all give me this nice, warm, fuzzy feeling inside, thanks so much for wlecoming me, it means a lot! thanks for the welcome Gardener! Glad you found Crochetville! Welcome aboard! O I noticed you're the Rachel from crochet pattern central!!! I love browsing through your site it's great! I was just about to send you an email the other day to ask you a question, what a coincidence! from Michigan! just checked out your blog, and bookmarked it for further reference......looks good! Thanks for the welcome and for checking out my blog!! I just started it, so I hope to have a bunch more great things on there! Again, Thanks! Hi Rachel, and welcome to the 'ville'! I know you will enjoy it! Thanks for the welcome Champygirl! I checked out your photos and they are awsome. I especially like your crochet mushroom, it's sooo cute! Thanks so much for the welcome! I have to say I checked out your site and you've made 367 blankets!!! WOW!! That is very impressive and I'm so glad that you do it for a great cause!